Sift the flours and the baking soda together and place in a mixing bowl. Make a well in the centre and slowly whisk in coconut cream and water. Cover the bowl with a damp tea towel and set aside to rest for 30 minutes. Combine durian and sugar (if using) and set aside. Heat a 12cm non-stick pan over low heat and lightly grease with some oil. When pan is warm, pour 2 to 3 tablespoons of the batter into the middle and gently spread it out with the back of a wooden spoon. Sprinkle over 1 tablespoon of caster sugar and cover the pan with a lid for 5 seconds. 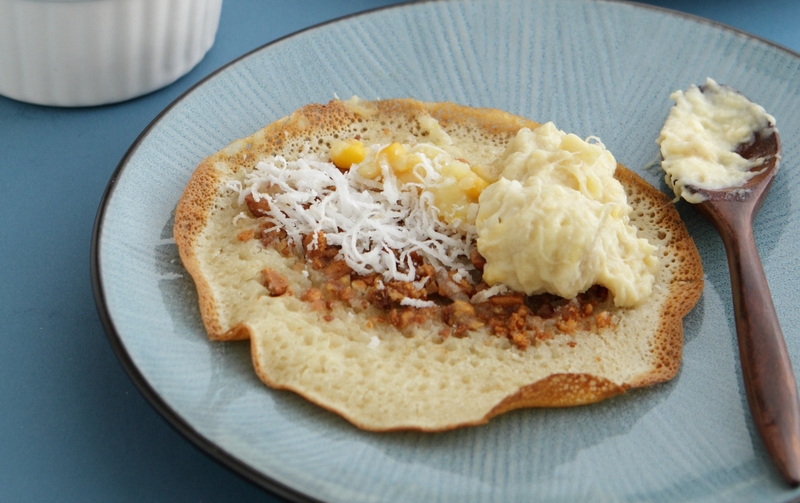 Once the sides of the apam start to brown, top with 2 to 3 tablespoons of peanuts, 1 heaped tablespoon each of grated coconut, sweet corn and finally, butter. Then top with a large dollop of durian flesh and fold the apam in half. Remove apam from the pan and place onto a serving plate. Repeat for the rest of the batter. Serve immediately. Note: It’s best to use good quality durian flesh, such as the Musang King or XO for this recipe.